The patch (1.3) is out. Not enough to draw me back now but some fun stuff that will make a second play through some day more interesting / compelling! I wonder what the NEW STORY in FALL 2018 will be about? I am currently 4 hours in... and I think I am in for a treat on this game.. seems I will love it. I currently feel the combat slow... hope it picks up soon and... is it me or does the R targeting feel like it is buggy.. if I want to lure an enemy.. i need to press R twice... is that right? For luring, you target with R, then hit up on the "d-pad". Combat is horrendously slow in the beginning, yes. I know how the luringworks... what confuses me a bit is the targeting... if i press R once, sometimes nothing get targetted.. i need to double press R for it to work. Is this intended to work like this? No, sounds bugged or out of range? It's not the most elegant targeting around. I will give it a few more trys and let you guys know... but seems if i see some mobs at a distance.. i need to push R twice for it to target something. That's probably because you're running at the enemy and the first press happens too far away while you're closer on the second press. Even then, it's not the best targeting out there and frequently targets the wrong thing. I have decided to play JUST this game.. and not alongside anyother. Given my limited time.... I want to focus on one at a time. Breath of the Wild will have to wait. Now...I see what the annoyance fuss is with the tutorials. It can be a problem when you want to go back and review certain things. For example.. on the mini map.. thee are some MARKERS.. like an "upside" power ON symbol. (I hope i described it correctly.) What are those for? If I die during battle.. I am taken back to a previous spot in the outdoor map. Does the game "reset" or does the XP and progress made BEFORE I was killed gets erased? If you go into the menu and choose Skip Travel that will show you all the icons and what they mean. Dying has never penalty. You keep all xp, etc. You warp to the closest or most recent Skip Travel location, I believe. I really like a lot about this game but I’m also looking forward to being done with it, if that makes any sense. XC1 is in my top five RPGs ever probably so that may have influenced my feelings. Granted it's not as high quality as rips of the actual OST will be, but for anyone who wants eight hours of XC2 muzac, well, you're welcome. 1.4.0 is out this Friday. Two new Blades. Deets here. I think I'm around 3/4 complete, been thinking of powering through the rest. It's been a few months though, I don't relish the thought of learning the combat and remembering what's what . That's my problem with Xenoblade X. I was around Chapter 11, but I can't remember how to play it anymore, so meh. Perhaps I will start anew before the kids wreck the WiiU. So I only just discovered that you have a weapon to fire in Tiger Tiger. I was never able to get past the red shark. Now I’ve finally been able to collect and see about upgrading poppy. Only took me till 30 hours in game. Soundtrack has been released digitally outside of Japan. iTunes has it, as does Amazon, but it doesn't appear Spotify does. Booo. Holy crap, it's $40. Now it's time to prioritize which songs I actually want. The Tantal city ones are a given. Maybe Indol as well. Edit: f*ck it. I'll get them all. Yeah, it's 5 discs, so the digital isn't cheap either. Edit: Wow, the remastered sound is way better than the sound ripped from the game. The guitars scream at you now. And the vocals even more haunting. I'm totally in love with the voice from the Theosoir night song. Patch 1.41 is out tomorrow with a handful of new quests. So I just started playing, and I'm about three hours in. Sounds like I'm headed toward the first real town in the open world area. I'm definitely confused about the icons on the mini map mentioned, so I'll have to go check the skip travel map. Now that I'm in the open world, I'm starting to get frustrated. I got killed a half dozen times in about twenty minutes. Every time, it's because some mob that's way higher level than me went aggro, either because I didn't see it (out of camera view), or the level number didn't appear until I was almost within aggro range. And is there any indication of what monsters will aggro and what ones won't? I don't mind having to avoid aggro mobs, but if I can't tell aggro from not, it'll just mean trying to avoid everything I don't want to fight, and that'll get annoying real fast. I'm also already tired of hearing some of the audio barks. This may not bode well. Also not thrilled with Pyra's....abundant eye candy. Makes me embarrassed to play on the bus. Part of what makes a Xeno game a Xeno game is learning what creatures will be aggressive. It's one of the "living in a world" things they do and I like it. It gives the environments a different feel. That said, it can be annoying to some and I've seen many a comment about people who just give up because they hate suddenly being one-shotted out of nowhere. The best I can say is if the creature looks like a lion or gorilla, it's likely to attack. If it looks like a brontosauras or deer it's probably not going to attack. If something is huge, you might want to avoid it. I get that. But I'm not sure it's consistent? In the initial open world area, there's a bunch of giant bear looking things roaming around at my level. They don't seem to attack. But then I got jumped by another giant bear looking thing five levels above me that looked almost the same except it maybe had horns, and was aggressive. It was also weird that the death penalty was basically getting warped 100' away to the last checkpoint. Made it feel more annoying than anything else. 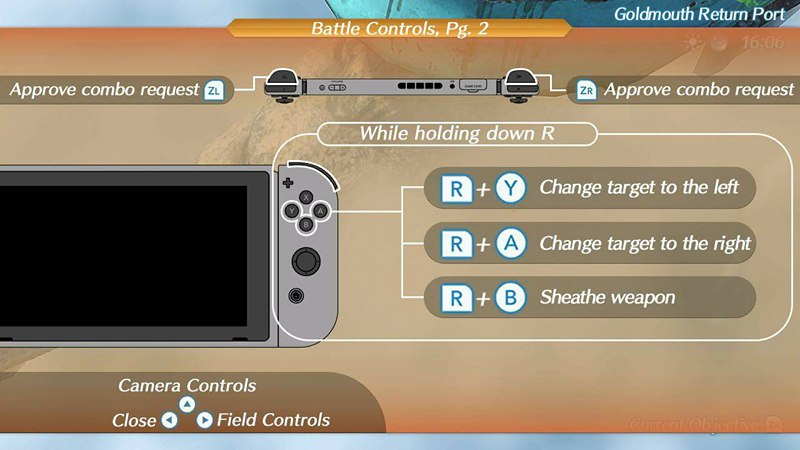 Also, is there's somewhere that shows the controls? I can't figure out how to change targets, and can't remember what the tutorial said. I think it must be L or R, because that's how I've been targeting the first thing, but I can't figure out how to switch targets if I have more than one mob fighting me. I'm not sure which creatures you're talking about in that area, but I assume it's a level thing. Meaning, the others were docile because they were lower level than you. 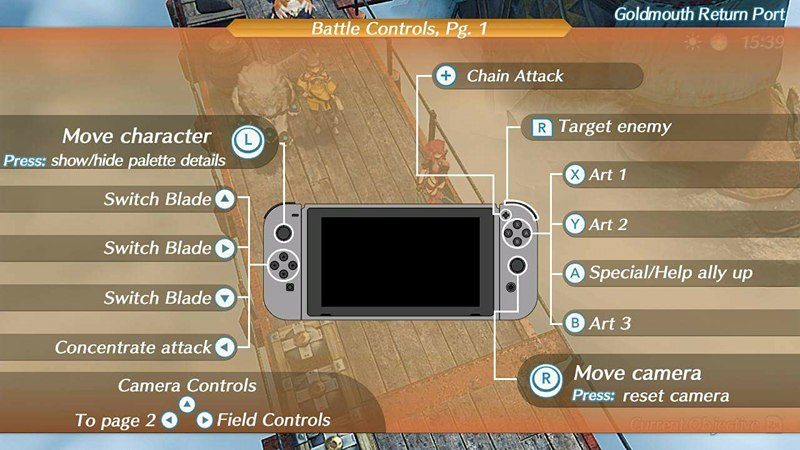 I need to look into this (more) because the system in XC2 is different from XCX and I'm struggling to recall exactly how it works. Thanks. That's helpful, and I never would've found that on my own. The QTEs are kind of killing me. I keep going for the XY/AB button layout and screwing up because it's YX/BA. At least there doesn't seem to be a huge penalty for failing those prompts. You can turn off the “audio barks.” Well, lower them to the point that you can’t hear them anymore.